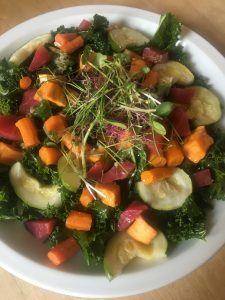 Roasted Vegetable Salad | Ridge's Stitches | Health Coach. Yoga. Clothing. Roasting vegetables is such a great way to bring out the flavors and vibrant colors of a food. You can roast vegetables for however long it takes for them to be done. If you are roasting them at a lower temperature for a longer period of time (300℉ for about an hour), this will create a more uniform texture throughout the veggie. The higher the temperature and shorter cooking time (450℉ for about 20-25 minutes) will create a more colorful exterior of the vegetable. I usually roast at 425℉ for about 30 minutes, or as long as it takes for them to be slightly crispy on the outside and tender on the inside with a beautiful color. This recipe will be great for a couple servings. Have a friend over for a meal or eat throughout the week. Leave the rosemary lemon dressing off until you are ready to eat it! Preheat the oven to 425℉ and roast the chopped veggies for 25-30 minutes until tender on the inside and slightly crispy on the outside. You can do this beforehand and store them in the refrigerator. Cook the beans if you are getting them dried. Learn how here! Put everything in a bowl and toss with rosemary, lemon dressing.